I don’t normally like to fish on Mondays as you are never aware of what bait has gone in over the weekend and which swims have been fished. 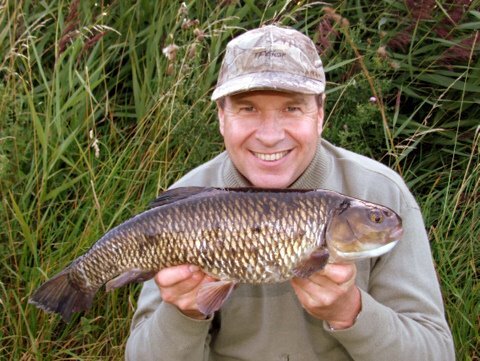 I had arranged to meet my mate Andy Cowley for an afternoon session and hopefully show him a few of the good swims. The weather had changed and it had rained for long periods of time on Sunday. I didn’t arrive on the river until 9.30am which is much later than normal. I was expecting to see it up and coloured a little instead I found it with a slight tinge of colour but you could still see the bottom in most of the swims I fish. The flow had increased but only marginally and unless you saw the pathetic flow over the last few weeks you wouldn’t appreciate the difference. 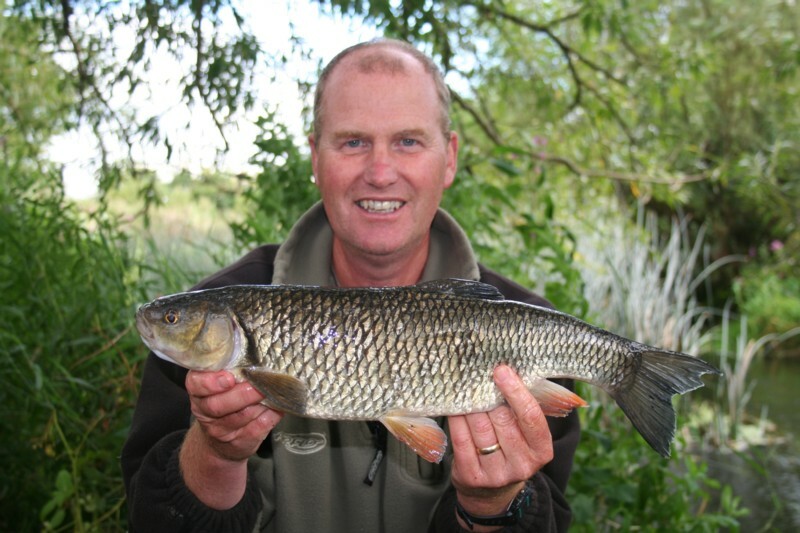 I met Shaun and he had struggled to see barbel let alone catch one. Uh-mm things not looking too good. I decided to bait a swim where I had lost a large fish a couple of weeks ago, so out went a few pellets. 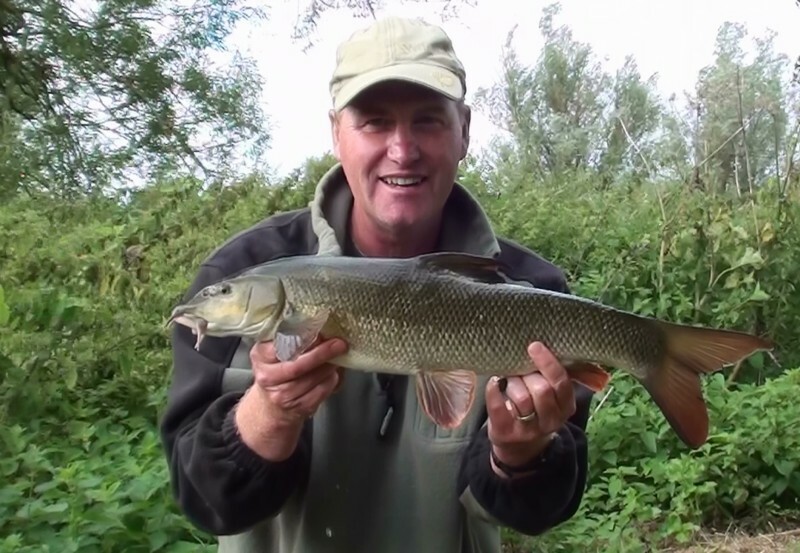 A large barbel put in an appearance for a short while then disappeared. There were a couple of good chub to over 5lbs feeding on the bait but not the barbel. While I waited for the barbel to arrive I ventured to another swim where I tried for some chub, they were really nervous and didn’t like to show too much. I was thinking about the Boom Town Rats “I don’t like Mondays” song and rolling it around my head. My word, it was dead quite. I returned to the original swim and promptly lost a small barbel of about 6lbs, the 12lb braid hooklink broke, was it that boulder again? I didn’t hang around too long to find out as Andy had just arrived and I walked to meet him. We walked and talked and baited a few swims. I showed him the spot where if you throw in a few pellets then these 6″ barbel start to feed on them together with the chub. There are about 4 of them in the pool and last week they were chasing a grandad of a barbel of about 2lbs around trying to hang out with the big boy. Most of the swims we fed contained chub but no barbel. Andy settled into a swim that might just produce barbel under the far side tree growth. I wasn’t very happy at not seeing any barbel so returned to a swim where there is always a chance of a fish or two. I cast out close to mid river knowing that the flavour as it drifted down in the flow would pull the barbel out from the snag downstream and up onto the bait. I used a small PVA stocking with pellets as an attractor and as a few offerings. I short under arm lob had the bait in position. I didn’t need to wait too long, as after 30 minutes the rod gave that 3 ft twitch and it was hook and hold and I bought the fish under control easily. It buried itself in the cabbages a few times however it’s quite easy to extract them without pulling too much. Soon it was time for it to be famous, I didn’t weigh it but just took a mug shot and I’m not talking about me. Just a small one but no blanking today! There is one amongst the shoal that does 10lbs plus though so that would be interesting to hook in this tight swim. Andy walked back up to find me fishing another swim where I had some small chub feeding on pellets. I was just killing time really until the other swim recovered. We watched the chub pick up and eject the bait a few times and even take it off the hair without any indication. However I soon fooled one into getting hooked and as it twisted and turned, even a pike came over to investigate and I swiftly bundled it into the net so that the pike couldn’t attack it. Andy and I had some fun guessing the weigth, he said 3lbs 7oz and I said 3lbs 6oz…………I won it was 3lbs 6oz. We had a couple of choices we could stay or move on and fish a few more swims. In the end our decision was to move on. As we talked and walked we saw few barbel. In the end I took Andy to a swim where I had taken the 8lb barbel and 5lb chub last week. As I trickled in a few pellets the chub came out to play. There was one or two that were over 5lbs together with a good few over 4lbs. We then spotted a few barbel so we fed these, one larger barbel appeared with one of about 7lbs or so. Again we disagreed on the weight but it was very close to double figures and the first one I had seen in the swim of this size. It was feeding on the pellets but would seldom come out from under the bank-side vegetation into open water. The chub were having a go so it was these that we targeted. The evening was moving on to dusk and I needed to leave so I said farewell to Andy leaving him there to catch a chub or two or even that barbel. Just as I was arriving home he sent me a sms saying he had a chub of 4lbs 13oz. He sent me a photo of this old warrior and the fish looks oldish too. Nice fish though Andy. Well done Andy 4lbs 13oz a good Bristol Avon chub. This entry was posted on Wednesday, August 10th, 2011 at 6:35 pm	and is filed under Uncategorized. You can follow any responses to this entry through the RSS 2.0 feed. Both comments and pings are currently closed.